According to Tom is my blog, simply a place where I can write about the things that interest me and are going on in my life. I'll cover things like music, food, reading, writing, health and fitness, or just talk about what I think is worth talking about! Hope you enjoy, and make sure to subscribe to see when I post. With 2013 coming in but a few short hours, many people are already thinking about what the new year will mean for them. It is a time for contemplating what changes we will make in ourselves, in our lives, and in our habits. It is a time of thought and reflection, including a period of self criticism and esteem bashing fun that makes us so guilty we won't touch another donut ever again. Overall, it is one of my favourite times of the year...despite the fact it is the last part of the year. For many people, the new year also serves as a time of commitment to something new or challenging, or something in between. I have my own goals and aspirations, such as finishing my book, but there is something different for each individual out there. Some of you, (whom I write this post for), may be thinking about starting to exercise more and go to the gym, and maybe even to eat healthily on the side. If that is the case, then I say that is an excellent goal, but sometimes the going gets tough and working out or even knowing how to start or what to do can be daunting. For those of you who ever feel stuck or lost, this section of my blog is dedicated to helping you succeed! And, on a side note, for those of you who do know how to work out and how to be healthy, perhaps this post will help you not work out better, but work out smarter. And now, for the recipe. You have just spent fifteen hours in the gym, (or at least it feels that way some days), and your arms and legs feel like lead after lifting heavy pieces of metal over your head repeatedly for reasons you cannot fathom. You leave the gym, shower, and then many people just sit down and watch T.V. and relax a bit. Absolutely nothing wrong with that, except for the diminishing returns you just got on your workout. Now, I am no nutritionist, I am sixteen. But I do know this basic logic: Lift heavy stuff = muscle tearing, muscle tearing = room for muscle gaining. However, in order to do this you need protein, and this is where this post workout snack really excels. IT MUST BE AMAZING FOR YOU!!! Side note* You can switch out honey and peanut butter for jam, but peanut butter helps add protein so I recommend it over jam. Jam also has more sugar. 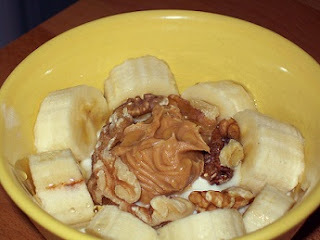 So, now that you have all the ingredients, just chop up the banana into bite sized pieces, and add everything into the yogurt and stir. That is all you need to do. Finished. Done. The End. Absolutely no need for high powered blender-made smoothies or supplements when you can easily get over twenty grams of protein just from yogurt and peanut butter. And, it doesn't even cost much. Hope you try this post workout snack and enjoy it, and if it works for you make sure to share the recipe with those you know! Best luck to all in the new year! it just happened! When you mix it everything looks fine! Follow by Email! Get updates when I post! Blog Update - I'm in Romania!